For anyone who might be thinking about getting this procedure done or is in the middle of recovery, I wanted to offer my personal story and rehabilitation as I progress through getting to 100% again. On April 27th, 2015 I had my right shoulder operated on. 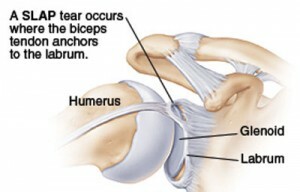 Diagnosis: Superior Labrum tear Type II. I only had one anchor (thankfully) put at about the 11 o’clock position. Prior to surgery I was able to do some research on expected outcome(s) as well as rehabilitation guidelines. My first thoughts were, “This doesn’t seem too bad”. I sure was wrong, at least in the beginning. The first week was not fun at all. In fact, the first night I did not sleep but a couple of hours; sleeping propped up with a few pillows. After not showering for two days, I had a friend come over and help me get undressed because I couldn’t get my shirt on or off. Length of time wearing sling: 4 weeks. It was difficult to get dressed and eat the first couple of weeks. But as time passed, I began to do pendulum exercises to attain blood flow to the area and keep my shoulder from freezing and getting stiff. I recommend doing these after the first couple of weeks (with the surgeon’s “okay” of course). By the end of week 4 I was ready to be out of the sling. And after my visit with the Orthopedic Surgeon, I was given the thumbs up to stop wearing the sling and begin physical therapy. WOO! The first day of physical therapy I was extremely stiff and my range of motion (ROM) was terrible. However, I wanted to stay positive so I tried to keep my spirits high. I was given exercises to perform at home on my way out. ALWAYS DO YOUR AT HOME EXERCISES. I cannot begin to tell you how much this has been improving my ROM and helping me stay positive. By PT visit number 2, five days later, my ROM had improved drastically. So if there is any advice I can give so far, follow your Ortho Doc’s guidelines as well as your Physical Therapist’s guidelines and do what they tell you to. (And do not do things they told you not to). I had my third Physical Therapist visit today and I am extremely happy with how far along I am in recovery. It is a slow process, nonetheless, every little bit of strength and range of motion I get back is a win in my book. My pain at this point is very minimal and my shoulder and biceps tendon are more “achy” than anything. The muscles around the labrum are super angry with me, very inflamed and tight though. 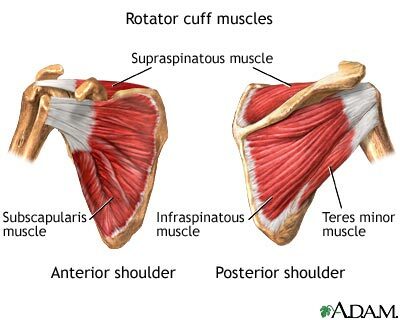 I would say my deltoid as well as my infraspinatous are the most painful right now. A lot of massages have taken place at my PT sessions as well as at home. I highly recommend icing your shoulder after every PT session, if they don’t already do it there, and at home after your finished doing your movements. Unfortunately, I am still not cleared to run or do about anything fitness related except for riding a stationary bike. Hopefully I will be at my next ortho visit in a few weeks. If you just had surgery, stay positive! It’s a slow process. If you are farther along in your rehabilitation process feel free to leave a comment or contact me with any advice or stories. Thanks for taking time to read this post and I’ll post another update with my progress in a couple days! Also, here is a, sort of cheesy but has pretty good tips, video on tips for staying positive during injuries. Hope it can help in some way!